Thermal/acoustic insulation systems are designed to replace and/or augment the existing thermal insulation system, and meet the minimum requirements for aircraft insulation as defined by the aircraft’s maintenance manual. In addition, it will substantially reduce externally generated noise (e.g., aerodynamic and engine-related). In applications that require noise reduction for the entire occupied volume of the aircraft, the entire pressure vessel is addressed. Localized noise reduction can also be accommodated by treating only specific areas of the aircraft. Acoustics are a much more complex subset of thermal/acoustic insulation performance parameters; we could not possibly illustrate all the effects, phenomena, and techniques here. 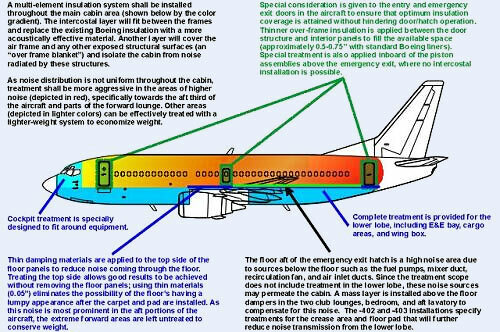 Instead, the following diagram exhibits typical performance parameters and techniques for VIP aircraft. Commercial-grade insulation systems are intended to be as light as possible. To do so, designers choose the minimum amount of thermal insulation required to meet their operational standards. In VIP-configured aircraft, however, passenger comfort is much more critical; in particular, the aircraft is expected to provide a consistent, controllable temperature throughout the cabin. The insulation system should support this ability. Aerocon's systems are designed to provide thermally stable cabins throughout all operating conditions (typically, -80 to +140ºF). The basic concept uses high-performance insulation materials with low thermal conductivity values, while accommodating the specific requirements of compression, cold-soak, and limited-clearance. The entire aircraft is also evaluated to determine hot and cold spots, which are treated accordingly to provide a consistent baseline temperature and allow the environmental control system to function efficiently. All of Aerocon's noise reduction systems meet the applicable requirements of FAR 25.853(a) and 25.856(a). Additionally, lower-lobe burn-through protection satisfying FAR 25.856(b) is available as required. Although the FAA has identified that the maximum benefit from burn-through protecting materials will be felt in the lower half of the aircraft (the area that would be impinged by flames from a post-crash fire, accounting for the failure of one or more landing gear elements), many customers have expressed concern for extreme circumstances where the top half of the aircraft may be exposed to fire (as in the case of a roll-over crash). In response to such concern, Aerocon can provide optional burn-through protection for the entire aircraft. This protection is incorporated into the insulation system at the time of manufacture, in order to minimize cost and weight. Other fire-blocking bulkheads can be included as required by the aircraft's specific mission profile. Burn-through treatment will protect the occupied areas of the aircraft from direct flame incursion for at least 4 minutes (typically longer than 15 minutes in laboratory testing), and limit the overall heat flux through the insulation system to 2 BTU/ft2-sec, thus satisfying the requirements of FAR 25.856(b) at Amendment 25-111.